Bit of a posey/pretentious one today! Think something about wearing a bowler makes me wanna pose like a idiot! But ya know! Wearing "that" primark skirt again, which I've barely taken off since I bought it. Just love it! Im wearing the dress I wore at the Cosmo Blog Awards too, I absolutely adore it, I love metallic for autumn winter and its a really nice textured matt but shiney black, such a nice contrast! Off to London to a few events, including the Motel/GlossyBox one which everyone and their Mum seems to be going to! Should a right good'un though! I love meeting people, but its always one of those weird butterfly tummy feelings meeting people you follow online in real life! Cant wait to test out my new camera at a event too! Can't beleive the skirt is from primark! mannn I want that skirt! can't seem to find it in any Primarks though - is it relatively recent or not really? Love the nails, I've had that shade on all week and it's so nice! May see you at the Motel event on thursday, it looks like it's going to be really busy. I wish hats suited me... not fair! Looking beaut as per. I want that skirt. Love the nail shade, think I might have to try h&m, heard good reviews and its affordable. Wish I had that skirt! beautiful! I love your skirt ! Pretty polish. I haven't tried any of the H&M ones yet. i have this bowler hat! love it, practically goes with anything! 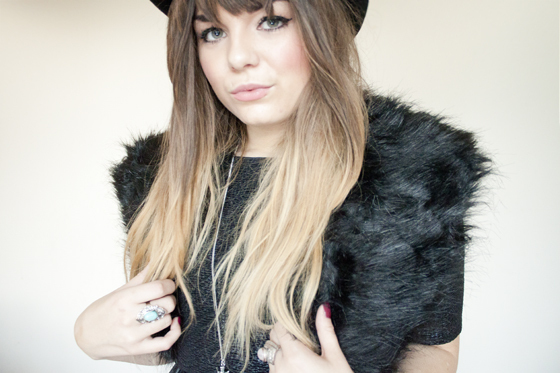 Absoloutly loving the bowler hat look darling, and is that a fringe I spy? Love love love that skirt too! Wow your nails are looking gorge! I know it's an extension, but I think the full fringe really suits you! it looks so amazing and very stylish :) love your hair. it suits you so well! i really adore your style it's so unique and chic. oh and without, hopefully, sounding like a stalker but some people i know are friends with your brother, jared! hereford is such a small world! 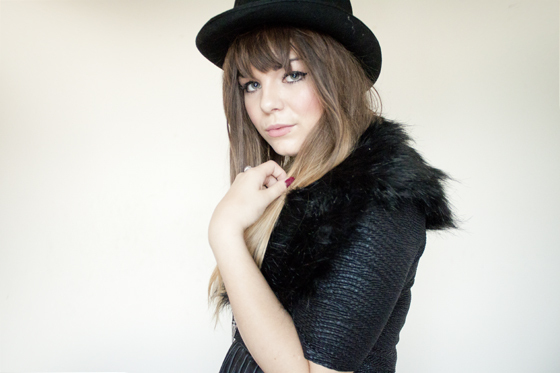 That fur stole and your faux fringe are absolutely darling items. amazing outfit and I love that nail colour so much!! another great post! Love your nail colour - especially against your black outfit! Will have to check out H&M polishes now. Your nails are fabulous as usual ! I love this skirt, I live in it too! Still can't find this skirt anywhere or even a similar one! you look great in this very shoreditch! jealous of your skirt!!! very cool look lily. You look so beautiful and I really love that nail polish colour. I also still love your fringe even though it's fake. You make me miss Primark. Fab look, adore the accessories too! Can't believe that skirt is Primark!! 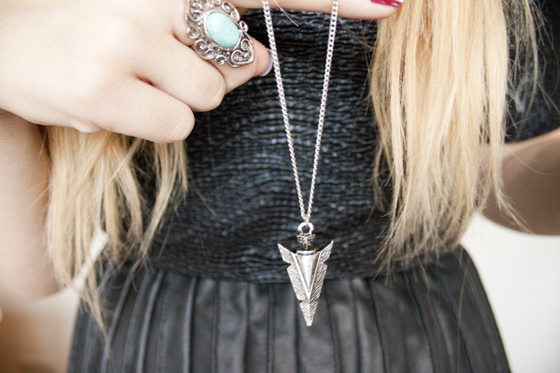 LOve the skirt, but that necklace is absolutely amazing! You look great with your outfit! The pleated skirt is so cute and it matched well with your cute top. We love it! Fringe= AMAZING!!! defo defo suits you! yet another gorgeous outfit post! I love the nail colour your wearing! The colour of your nails are lush! Such an autumn colour, pretty! Really suits you that boweler hat does! Top notch. I Get that sickly butterfly feeling also, but I get it when meetig people in general! Can't believe that's a primark skirt either! Saw similar ones in other stores for such an expencive price. You should get a real fringe, it really suits you! I love the nail polish, and for Primark that skirt looks rather expensive! Awesome look! Accessories and skirt, can you just give them to me? - a new blogger, have a nosy if you want! Wow! your hair! have bangs! you look older but very well look great! wonderful!